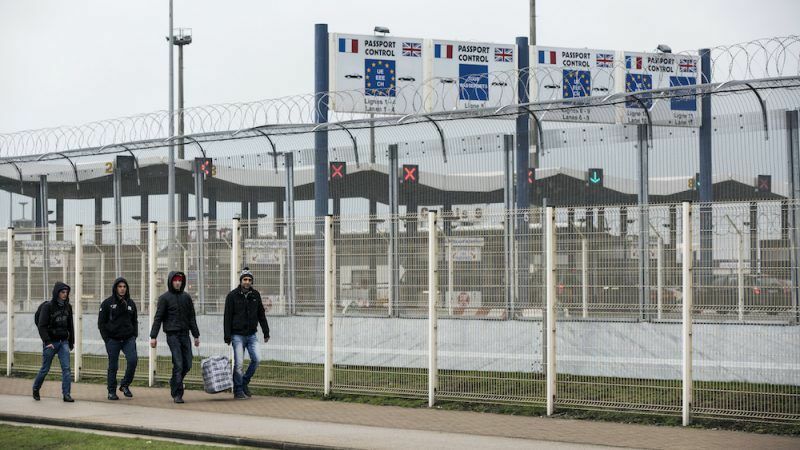 If the frontier was on British rather than on French soil, the French believe the immigrants would not be drawn to Calais, writes Denis MacShane. Denis MacShane is the former Europe minister and author of Brexit, No Exit. Why (in the End) Britain Won’t Leave Europe (IB Tauris). In the 16th century, Queen Mary said Calais would be engraved on her heart as England finally gave up to France the coastal town that had been England’s gateway to the continent since William the Conqueror. This week President Macron arrives to meet Theresa May and Calais will top the British-French summit agenda. Macron comes from north-west France and is acutely aware of the strength of feeling over Calais, not just in the town but across the entire region. Calais voted massively for Marine Le Pen and the region’s centre-right president, Xavier Bertrand, a former minister under Nicolas Sarkozy, has moved into the Macron camp. The town itself is miserable. The endless pressure of migrants and refugees desperate to enter Britain to join families or language communities and lured by the prospect of full employment jobs, an utterly deregulated labour market, the free NHS and no identity cards has cut house prices by 30% and left many citizens of Calais trapped in properties or small businesses they cannot sell. The approach roads to ferry or Eurotunnel terminals are lined by walls or barbed wire link fences and town centre shops and stores have been decimated by giant shopping centres to cater for UK day-trippers filling up with cheap wine and beer. Locals blame the Le Touquet Treaty, signed at a similar British-French summit under Tony Blair and Jacques Chirac early in 2003, which in effect moved the UK frontier onto French soil. I took part in the Le Touquet discussions as Europe minister and in 2015 debated with Xavier Bertrand on French radio and TV when the Calais “jungle” refugee crisis reached one of its boiling points. He wanted the frontier put back into Kent. My efforts to point out that it made sense to have passport controls at the point of leaving a country – as Eurostar passengers face at St Pancras and not at Gare du Nord – fell on deaf ears. If the frontier was on British rather than French soil, the French believe the immigrants would not be drawn to Calais. Macron knows that does not make sense but he wants more help with the UK, at least ceasing its present cruelty towards children in the refugee camps and to allow those with families already in Britain to be screened and allowed to join. France spends a fortune on police and other security costs to deal with a problem that the French think is mainly Britain’s fault and responsibility. Now comes Brexit and the need to install giant centres for customs controls on the four million lorries, vans and cars that cross the Channel every year. When Britain leaves the Customs Union, there is no technological fix that can replace the need for spot and other checks that goods are not being brought in duty-free or with components that do not comply with EU laws. Mr Macron and France’s Channel coastal regions believe that l’Albion perfide should not dump the full cost of this massive new customs control infrastructure on the French taxpayer. The Le Touquet summit in early 2003 was friendly and easy with only the shadow of Iraq ahead, though at the time France had not announced its UN veto on the venture. This week’s summit is much more fraught. Mr Macron needs something to show he is dealing with Calais. What can Mrs May offer?